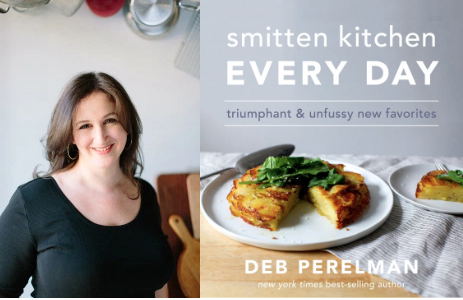 The highly acclaimed cook and Smitten Kitchen blogger, Deb Perelman, is joining us at Everybody’s Coffee, and you’re invited! Join us to celebrate the release of Deb’s newest book, Smitten Kitchen Every Day: Triumphant and Unfussy New Favorites. Deb emerges from her tiny kitchen to converse with writer, editor, and recipe taster Rachel Holtzman. Deb will also sign books for all of her foodie fans in Chicago. Deb Perelman is a self-taught home cook and photographer; and the creator of the award-winning blog, Smitten Kitchen. She lives in New York City with her husband and their children. Deb Perelman—the beloved food blogger, mom, creator of SmittenKitchen.com, and author of the best-selling, award-winning The Smitten Kitchen Cookbook—is back. Smitten Kitchen Every Day: Triumphant and Unfussy New Favorites contains more than 100 of the approachable, accessible, easy-to-cook, and impossible-to-resist recipes from her tiny kitchen that home cooks have fallen in love with. A perfect gift for your mom, your friends, your boss, or yourself, Smitten Kitchen Everyday is filled with what are sure to be your new favorite things to cook. Rachel Holtzman is a writer, editor, and recipe tester. She co-authors projects on topics ranging from cooking and entertaining to wellness and mind-body connection. Prior to starting her company, she was an editor at Penguin Books and ELLE magazine, with a brief turn in the kitchen at Gramercy Tavern. She lives in Chicago with her husband, two kids, and two pugs. « Welcome to Night Vale Book Launch: It Devours!